It followed news that the economies of Germany, France and Italy had all shrunk by more than expected. A recession is usually defined as two consecutive quarters of contraction. In the first three months of 2012 the eurozone economy failed to grow, but then in the second quarter of the year it contracted by 0.2% and it shrank by 0.1% in the third quarter. Carsten Brzeski from ING said: "These are horrible numbers, it's a widespread contraction, which does not match this positive picture of stabilisation and positive contagion." The data make for grim reading. It was the third consecutive contraction in Eurozone GDP, and the fifth in a row that has seen either no growth or decline. We don't have figures for all 17 eurozone countries, but of those that are covered only Estonia and Slovakia managed to grow at the end of last year. Nonetheless, the wider picture is not one of completely unremitting gloom. Industrial production for the end of the period (December) grew, and there have been some more encouraging signs in business surveys this year. That probably owes much to the improvement in financial markets that followed the European Central Bank's statements about its readiness to intervene. But even if these really are signs of stabilisation, the eurozone is a long way from either a convincing economic recovery or a solution to its financial crisis. But he added: "We still expect growth to return in the course of 2013 but any return of growth will be very small which means that the social impact of this recession, especially in the peripheral countries will be still a very severe one." Germany, the eurozone's biggest economy, saw the deepest contraction since the height of the financial crisis as its economy shrank 0.6%. It was hit by a sharp decline in exports. The German statistics office said: "Comparatively weak foreign trade was the decisive factor for the decline in the economic performance at the end of the year: in the final quarter of 2012 exports of goods declined significantly more than imports of goods." The French economy shrank by 0.3% in the fourth quarter, while Italy showed 0.9% contraction for the period. There are diverging views on the prospects for the different countries in the region. Economists remain upbeat about the outlook for Germany. "This is a temporary period of weakness in the German economy rather than the beginning of a long period of stagnation or even a recession " said Andreas Rees, chief German economist at the bank Unicredit. He added: "The outlook is very promising. The chances that the economy will return to growth at the beginning of this year are very good." That sentiment has been backed up by recent surveys. January's closely watched business confidence survey for Germany hit its highest level since before the eurozone crisis. 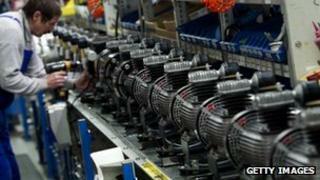 Eurozone purchasing managers' index (PMI) surveys for January also indicated the worst may be over. Germany, Spain and Italy all showed signs of stabilisation - although in France the downturn deepened. That is part of the reason why many analysts have predicted that France is heading for a recession. However, France's central bank recently forecast that the economy would just manage to grow in the first three months of 2013. French Finance Minister Pierre Moscovici admitted on French radio that the government may need to rethink its growth forecast of 0.8% for 2013. "We note that the figure for 2012 is not good, around zero, and so we also know that growth for 2013 will have to be re-thought." He added that he did not want to "condemn the country to recession" by adding "austerity to the difficulties of today". French President Francois Hollande is trying to make France more competitive by slashing government spending and relaxing labour regulations. Italy has been in recession since mid-2011. Prime Minister Mario Monti has introduced severe austerity measures to cut its debt and reassure markets that it is a safe country to lend to. An election is due on 24 February. The recent strength of the euro has been a source of concern for France in particular. France has called for a target to be set to stop the single currency from becoming so strong that it damages the recovery. A high valuation makes exports more expensive. This has led to renewed talk of "currency wars" - where countries compete to devalue their currencies to help boost exports. Policymakers have warned against raising those tensions. "We have to be cautious in my view not to build up the rhetoric about currency wars, because if we build up the rhetoric, the danger is there that something worse can happen" said the European Central Bank's Vice President Vitor Constancio at an event in Brussels.